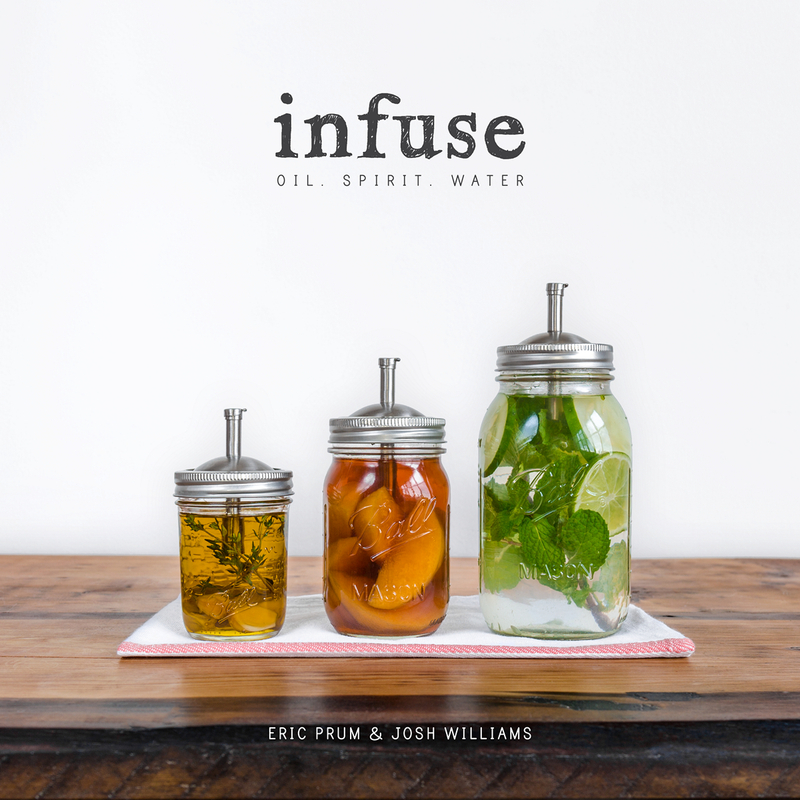 I really expected the cookbook, Infuse , by Eric Prum and Josh Williams, to be a commitment. I've made a lot of long-term infusions of my own that have taken months to finish. So I expected to see a lot of those recipes in the book. Instead, the book has quite a number of quick infusions that you make and use right away, short infusion that might be overnight or 24 hours, and then longer infusion from two to four weeks. I thought it was really interesting that the book started with a spicy oil, followed by a pizza recipe for using the oil, followed by some vinegar-and-oil salad dressings. I never really thought of salad dressings as infusions. I always considered them emulsions. But, if you're adding herbs and spices to the salad dressing, the flavor does infuse into the liquid. So, okay, I'm okay with calling them infusions. What I thought was interesting were the quick alcohol-and-fruit infusions. These recipes required muddling or mashing the fruit in the alcohol, shaking, and straining. Then they're ready to be used. I've always let my fruits mingle with the alcohol for much longer. The peach bourbon infusion that took four weeks was more like what I've made before. Water infusions - fruit water, refrigerator tea, and cold-brewed coffee - were pretty quick as well. Which is certainly normal for those. So, if you want to dabble in infusing and you're not the patient type, you might really like this book. If you're looking for deep, complicated infusions that you start in the summer and use in the winter, you won't find those here. I think four weeks was the longest infusion, although I'll admit I haven't read all the recipes in the book. 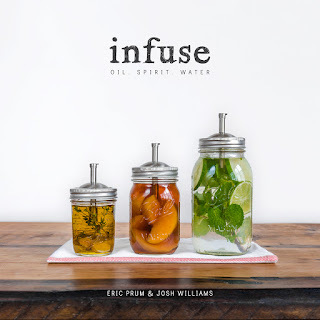 Along with the recipes for making the infusions, there are some recipes for using the infusions, like the pizza that used the spicy oil, pancakes to go with a syrup recipe, and a few drink recipes. There's not a recipe for each infusion, but I don't think they're necessary. Some of them are intended to be used as is, and the others should be easy to find a use for. Like photos? This book is very photo-heavy. Not only is there a photo for every recipe, but there are sometimes as many as three full-page photos between recipes, and a few times there were five full page photos in a row. The photos are nice, and some were informative in terms of ingredients, but it's a surprising number of photos compared to text. The one thing I didn't like about this book - and it's certainly not the fault of the authors - is that the font used for the recipes is small, and it's blue-gray instead of black, and the lines that make up the letters are thin. Fortunately there's a lot of white space - infusion recipes aren't all that complicated - so at least the text isn't crushed together. But I really wish they would have used some of that space to increase the font size by a point or two. And black text, please. With the slightly glossy paper, this was really hard to read. While I like the idea of the book and I'll probably play around with some of the recipes, if I was paging through this in a bookstore I have to say that I'd probably pass, just because of the readability factor. If you're thinking about buying it, I'd suggest looking at a copy first to see what you think of the text. I received this book from the publisher through Blogging for Books, for the purpose of a review.